With more musicians wanting the ability to make music on the move, there is undoubtedly a demand for high quality but portable audio interfaces. ESI's Duafire, while it might easily fit into a budget-conscious permanent home studio, is most certainly small enough to be transported alongside a laptop-based studio. So what does this little box have to offer the mobile recording musician? With a footprint about the size of a standard DVD case, the Duafire has the 'compact' box well and truly ticked. It offers two analogue inputs and four analogue outputs with sampling rates of 44.1, 48 and 96 kHz at 24-bit. The case is made of metal and feels very robust — only the three gain knobs protruding from the front panel mean that it might need a little care when throwing it into your kit bag. The front panel houses two quarter-inch line-input sockets with independent gain knobs. Input 1 also offers a separate XLR input with switchable 48V phantom power, while Input 2 can be switched between line and Hi-Z levels, the latter being ideal for direct input of guitar signals. Each input has a red 'clip' LED to indicate when the signal is getting too hot. Power LED aside, the only other feature on the front panel is the quarter-inch headphone socket, with its dedicated gain control. The Duafire's Control Panel software provides faders for all of the unit's inputs and outputs, and also allows users to set sample rate and determine latency.Things are equally straightforward on the rear panel. Outputs 1 and 2 are quarter-inch, line-level TRS sockets, while Outputs 3 and 4 are unbalanced RCA connectors. A pair of RCA inputs are also provided, intended for use with a turntable. They cannot be used simultaneously with the front-panel inputs, and a rear-panel switch allows the user to select which input pair is active. A ground connector is also supplied and can reduce hum when using a turntable with the phono inputs. A single Firewire connector, a socket for the included external power supply and a three-way power switch round off the controls. The power switch selects between off, bus power or the external power supply. If you're using a six-pin Firewire port on your host computer, the Duafire can be fully powered via Firewire, while a four-pin Firewire port (as found on many laptops) requires the external power supply to be used. This brief tour does reveal two obvious omissions. Firstly, the Duafire is audio-only — it has no MIDI I/O. However, as the majority of modern MIDI controller keyboards now provide USB connectivity, I suspect that most potential purchasers will not consider this a great loss. Secondly, the front panel does not offer a hardware control for the main output level. If you are monitoring through an amp/speaker system, adjusting the overall monitoring level will have to be done from your monitoring system or via software. Talking of software, as well as suitable drivers for Windows XP, Vista (32-bit version) and Mac OS X 10.3 and upwards, the Duafire is also supplied with a compact Control Panel application (described below). The handy printed User Guide aside, the other key inclusion is Cubase LE 4 software, which will be a very welcome addition for those new to computer-based recording (see the 'Start Me Up' box). Installation of the Duafire drivers and Control Panel software proceeded smoothly, and just a few minutes after taking the Duafire out of the box I was up and running. The Control Panel application itself is very straightforward. 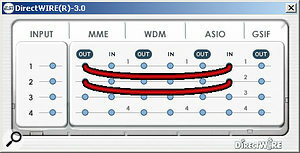 Virtual faders are provided for each of the two inputs and four outputs, and a left/right pair for overall output. Each pair can be chained for stereo operation and mute buttons are included. Input monitor buttons above the two input channel faders switch on direct (zero latency) monitoring and, usefully, if you're recording in mono, the direct monitoring signal is placed in the centre of the stereo image. On the down side, the display does not include any virtual metering of either input or output levels. 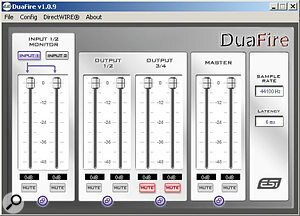 The Direct Wire options allow several audio applications to run simultaneously with audio being passed between them.The sample rate and latency can be set via the 'Config' menu, and this also includes options for mouse-wheel control of the faders (a nice touch) and the ability to clone the signal from outputs 1/2 to outputs 3/4. This might be useful if you need to send the output to both a monitoring system in the control room (outputs 1/2) and to a headphone amp system in the recording space. The other key feature of the Control Panel is 'Direct Wire'. This is ESI's own technology and has been available with their PCI-based audio interfaces for some years. 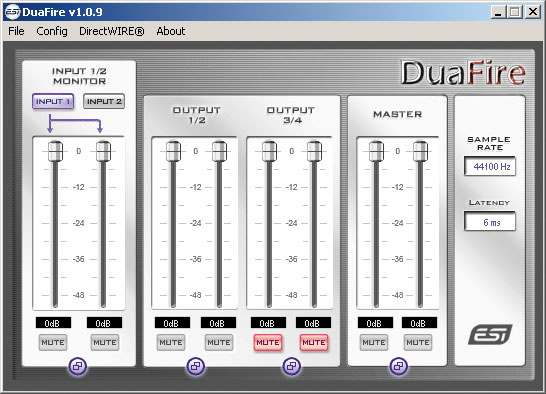 Direct Wire allows audio to be routed between different audio applications that are running at the same time. The most obvious application of this is for passing audio from one application (for example, a media player application) to another (such as an audio editor), allowing the audio to be recorded without any need for external wiring or multiple audio interfaces. The Direct Wire window shows a patchbay arrangement not unlike the back of the Reason rack (see above), and this flexible routing is a neat extra feature. Usefully, the printed manual includes some basic examples to illustrate how Direct Wire is used. The Duafire is bundled with Steinberg's Cubase LE 4 software, which, while it doesn't offer all the bells and whistles of the full version, is a pretty impressive freebie recording application. Offering 48 audio tracks, 64 MIDI tracks, a decent selection of plug-in effects and the Halion One sample player, it provides plenty to get the computer recording novice off to a sophisticated start. When users outgrow the LE version, an upgrade route to the full version is available. In subjective terms, my initial impressions of the audio quality of the Duafire were positive. Playback of a selection of commercial test material, ranging from orchestral through to rock and dance, suggested that the audio was being faithfully reproduced with no obvious tonal bias. A quick A/B comparison with the more expensive Konnekt 24D interface connected to my test system suggested that the sound of the latter was perhaps a little more detailed, with somewhat better stereo imaging, but the differences were not major and, overall, the sound of the Duafire was very useable and workmanlike. There was also plenty of output level. As an alternative to the usual quarter-inch jack inputs, the Duafire offers a pair of RCA phono sockets for connecting a turntable.Recording via the various input formats — line level, mic preamp with phantom power and Hi-Z — also produced solid results with a range of audio sources such as spoken voice and acoustic and electric guitars. The mic preamp is obviously not going to match the quality of those on more up-market units but, in a home studio or mobile recording environment, and providing all the usual attention is paid to the rest of the audio signal path, the Duafire would enable you to get a very respectable recording job done. These subjective views were confirmed by testing with Rightmark's Audio Analyser (v.5.5). Noise levels of -91.3dBA, THD at 0.0025 percent and a stereo crosstalk level of -91.4dB for 44.1kHz/24-bit operation, while not exceptional, are perfectly respectable. Having done some initial experiments with Wavelab, Sound Forge and Acid Pro, I did the bulk of my testing with the full version of Cubase 4.1.3. There is, in truth, little to say — and this is a good thing, as the Duafire just got on with the job with an absolute minimum of fuss. At comfortable 6ms latency settings, I was able to run quite complex projects containing mixtures of MIDI, audio and video tracks, and plenty of plug-ins, without the system seeming overly stressed. The drivers, therefore, seem to be both solid and efficient. Given that the Duafire is most likely to appeal to the home or mobile studio owner, I'm not absolutely convinced of the usefulness of the second output pair. For these users, a two-in/two-out — or even a four-in/two-out — combination might be more appealing. It might also have been nice to see the headphone gain control simply assigned to control overall output level of both headphones and main outputs, with independent controls within the software Control Panel. I'm sure some users, like myself, would rather scramble for a knob to mute the output level rather than a mouse whenever the phone rings or the neighbours bang on the wall. There is, of course, plenty of competition out there for the Duafire, and somewhat different feature sets will appeal to particular users. However, the Duafire is compact, sturdily built and offers perfectly respectable audio performance. Those in the market for a Firewire-based audio interface for a small or mobile recording setup should certainly consider it alongside the alternatives in the same price bracket. There are a number of other small Firewire-based audio interfaces in a similar price range to the Duafire, but obvious candidates would be the M-Audio Solo, Mackie Onyx Satellite, Presonus Inspire 1394 and the TC Electronic Konnekt 6. While each offers a different I/O combination, they all provide at least one mic preamp with phantom power. If you are happy to consider a USB2-based unit, the choice is even wider, with the Alesis IO/2, Lexicon Lambda or Omega, M-Audio Fast Track Pro and Edirol UA25 offering similar sorts of features at prices competitive with the Duafire. No hardware control for main output level on front panel. 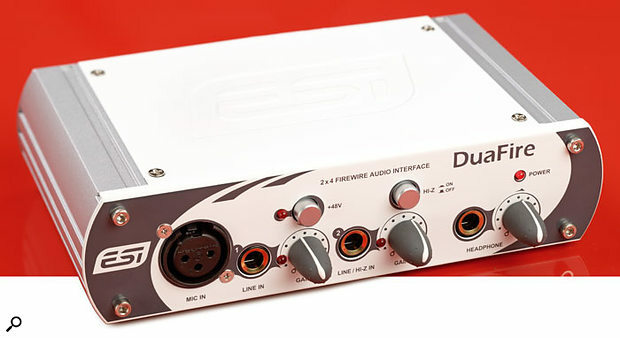 The Duafire is a compact and sturdy audio interface that performs well. Certainly worthy of an audition for small or mobile recording setups.